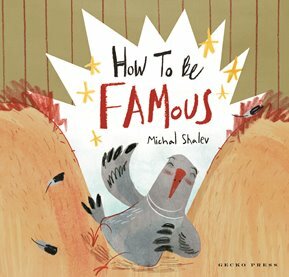 Learn how to be famous from a totally self-centred pigeon. His family have been famous for generations and live on a famous statue. On a visit to the zoo he sees every situation he is in, and some of them are very precarious - including balancing on a crocodile's nose which he thinks is a catwalk, as further evidence of his fame. There is a laugh on every page as the reader sees the truth of the pigeon's situation and his view of it. The illustrations are marvellously loose, with scribbles of crayon and coloured pencil over washes of limited colour. It gives the impression of having been very hurriedly done, but this is not a negative quality, rather it adds to the impulsive enthusiasm of the character and the speed of the rollicking tale. The pigeon is optimistic right to the very dark end. A great tale for this selfie age to be enjoyed by readers young and old. The author illustrator has an interesting background, coming from Israel where she studied illustration and animation at the Neri Bloomfield School of Design and Education, then moving to the UK and getting a MA in children's book illustration from Cambridge School of Art. Have a look at her website , particularly see the page dedicated to her favourite animal - chickens!